From the 15th – 19th August, local and international artists from Derby-based Subism created “The Wall” in the Manchester’s Northern Quarter, a five day project resulting in the city’s largest urban painting, a positive contribution following a week of rioting across the country. 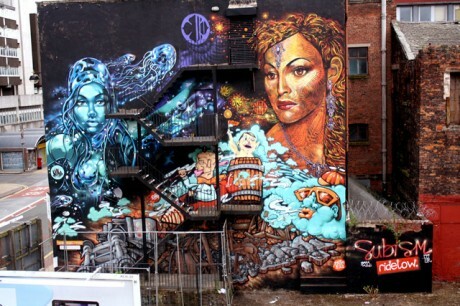 Four of Subism’s artists created the earth, wind, fire and water themed illustration on one of the most prominent walls in Manchester. The masterpiece was created by Deus, N4t4, Philth and Ventsa. For those of you who dont know, Subism Ltd is a multi-faceted independent creative business representing the Subism Artist Collective, a group of artists and creatives from around the world. 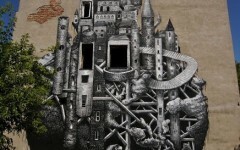 It offers commissions and murals as well as unique illustration services at subismcreate.com. I met N4t4 and Philth recently at a jam in Leicester, they both did pages in my book as well. Proper sound guys.